Lean, lithe, beautiful and effortlessly cool, Polly Kemp teaches yoga at a hip hotel and members’ club. She’s addicted to Instagram and loves fashion and travelling. But no, she’s not the woman on the left of the photograph – that’s her 19-year-old daughter Iggy, a model. Polly is a mother of three (she also has sons Gabriel, 22 and Finlay, 17, with her photographer husband Iain) and is 51. “Don’t get me wrong. I’m under no illusion that I am 19 or look 19; I’m very comfortable in my own skin – lines, grey hair and all,” she says. “But I know I live very differently from how my mother and grandmother did at my age. “Iggy and I often borrow each other’s clothes, although we might not wear them in the same way. And we both love vintage clothes, so we often trawl charity shops together. We enjoy the same TV series on Netflix, such as Schitt’s Creek, Girlboss and Grace and Frankie; and we’re following the same online daily yoga challenge on YouTube. Polly’s age-defying attitude is something I can relate to. Growing up, if I’d pictured myself aged 53, my hair would be a little less long and blonde and a great deal more grey than it actually is – and I’d be wearing frocks and face powder, not jeans and CC Cream. And now a new UK survey has found that, like Polly and me, 96 per cent of 40-plus women don’t feel middle-aged at all. The study of more than 500 women conducted by marketing agency SuperHuman, found that 80 per cent felt society’s assumptions about middle-aged women do not represent their lives. Most considered themselves in their prime of life, felt as vibrant and young as they ever have – partly due to a focus on health and fitness – and the vast majority don’t define themselves by age. Armed with negative stereotypes about older women, companies still focus on millennials despite the greater financial firepower of 40-plussers. Analysis of Australian Bureau of Statistics data from 2013 through to 2015 shows that those aged over 45 make up 40 per cent of the population – but control 79 per cent of the wealth. And overall, while women make three-quarters of all retail transactions, UK and US surveys both show that about 90 per cent of women don’t think advertisers understand them, and 70 per cent feel “alienated” by advertising. SuperHuman co-founder Rebecca Rhodes notes that 84 per cent of the women in its survey used products and services they felt were aimed at younger women. But the generation gap is closing. “Forty-plus women today look, feel and live differently than the generation before them – 90 per cent consider themselves to have a much younger attitude than their own mother’s generation at the same age,” she adds. In short, women in their 40s and beyond no longer associate themselves with a life of lawnmowers and Rotary Clubs, cheese and wine parties, elastic waists, river cruises and walking tours. Even the term “middle-aged” is fast becoming obsolete. People magazine named Julia Roberts, 49, as the World’s Most Beautiful Woman 2017, 26 years after she first made the list. And France’s youthful new president, 39-year-old Emmanuel Macron, has been pictured passionately kissing his glamorous blonde wife Brigitte, who just happens to be 64. Everywhere we look, highly visible older women are rewriting all the rules. The likes of J.K. Rowling, Nicole Kidman, Michelle Obama and Anna Wintour are at the peak of their power and creativity. This attitude can be helped by the way we look. And if that sounds trivial, it’s not, according to Ellen Langer, professor of psychology at Harvard University. Her researchers have found that people who feel old compared to others tend to age faster, and a major factor in this is the way they dress. Those in the study who wore uniforms, and so dressed the same as younger colleagues, had fewer agerelated illnesses. 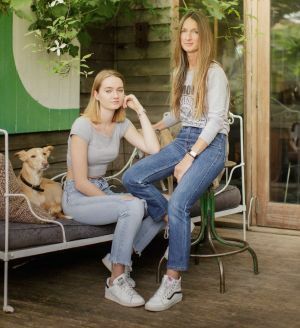 Indeed, shots of classic perennials Julianne Moore, 56, and Emma Watson, 27, reveal that despite their three-decade age gap, they favour an identikit look of striped tees, oversized coats, leather jackets, jeans and trainers. Lynne Barratt-Lee, 58, also a novelist, says she’s picked up her 24-year-old daughter Georgie’s online shopping habits. “We get confused over who’s put what in the Asos basket,” she says. But there’s one black cloud. In the survey, 48 per cent said they felt less confident about their appearance than a decade ago, citing pressure to stay looking young – and 83 per cent felt this affected their self-image. Rebecca calls this the “confidence paradox”, and adds that while older celebrities and models are more visible than ever before in advertising and on screen, women in their 40s and 50s still feel ignored. Entrepreneur Grace Fodor agrees. Two years ago, she founded cosmetics brand Studio 10, aimed at women in midlife. “Currently, older women are part of the zeitgeist,” says Fodor, 50. “But remember: we’re for life, not just this season’s marketing strategy.” The future, says Gina Pell, lies with forward-thinking companies such as Netflix and Amazon who profile customers by their tastes, not by their age. “Defining people by their birth year is so antiquated,” she concludes. ARE YOU PART OF THE AGELESS GENERATION? a) Huge, 10 years old, with velvet upholstery. b) Up-cycled from a tiki bar near your flat. c) A two-seater with floral loose covers. a) Netflix binge, obviously. b) Going out. It’s a bit tricky to kick back in a flatshare with five other people. c) Popping a DVD into the player and enjoying a glass of wine. a) Get on Pinterest and start pinning deep, dark-blue kitchens. b) Get on Pinterest and dream of one day owning your own home. c) Why would you decorate? You had that done when you moved in. a) Yottam Ottolenghi. You’re thinking of going vegan, or at least demi-vegie. b) Gwyneth Paltrow. She’s so beautiful. c) Margaret Fulton. Utterly reliable. a) Your iPhone. b) Your mates. c) Your osteopath. Mainly a) You are a perennial, of course – engaged, adventurous and tech-savvy. Mainly b) You’re a true millennial – but you share a lot of interests and attitudes with the new mid-lifers. Mainly c) You’re embracing traditional middle age. The only perennials you’re interested in are in your garden. The rest, frankly, sounds quite tiring.